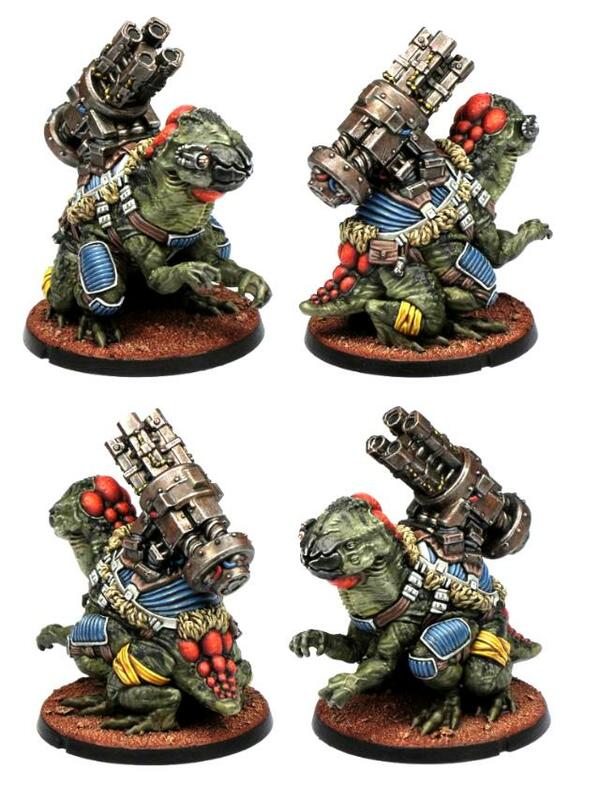 This month sees the release of a new support unit for the Broken: Pa'ku Artillery, available now from the webstore here! Behind the implacable visage of the Pa'ku resides a powerful, if often misunderstood intellect. Extremely logical creatures, when the Pa'ku are convinced a certain course of action will do more good than wrong, they will take lives without scruples if that is what it takes. Pa'ku artillery has been known to mercilessly bombard hospitals or civilian refugee groups when they have concluded that this was the most logical course of action. They do not make any decision lightly nor do they act carelessly. In fact, the Pa'ku sometimes drive their commanders crazy as they sit pondering the pros and cons of a proposed course of action and all the alternatives, and where the situation is particularly complex have been known to gather for private war councils with their own kind before they will consider responding to a call to arms. Despite their reputation for ruthlessness, when Pa'ku take lives it is because they believe there is no viable alternative. This does not however mean they are saints - all of a Pa'ku's deliberations are still ultimately guided by self-interest and a desire to survive the chaos of the Edge. Despite their peculiarities, Pa'ku are especially desirable to the Broken. Their solid physiques make them extremely suited to carrying heavy loads, including the biggest artillery the Broken manage to cobble together. At close range, the Pa'ku can extend their very long tongue with enough force to cave in a man's skull. Pa'ku only speak to other species when necessary, and their language is difficult for most races to translate or speak. Combined with their large size, this generally results in them being overlooked by evacuation efforts, and so as with the even larger Gnolti, joining the Broken is often the only reasonable chance for a Pa'ku to escape the edge and find a new home. Pa'ku are often found in the support lines of Broken forces with giant cannon and other esoteric weapons strapped to their broad shoulders. Linked with electronic targeting systems, these weapons can be slaved together to unleash devastating barrages of firepower onto enemy lines. Their favoured weapon is a multi-barrelled EMP mortar, which carpets the battlefield with explosive energy packets that can fry electronic systems and incinerate softer targets. 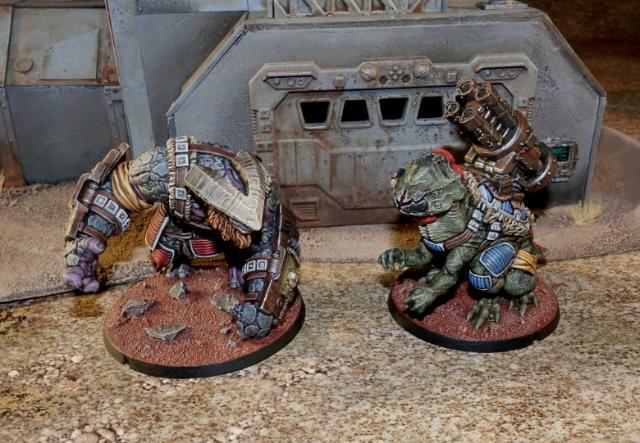 You can find the rules for the Pa'ku Artillery unit in the Force Builder section of the Maelstrom's Edge website here. This high detail, multi-part resin kit contains one Pa'ku armed with a Quad EMP Mortar, and is available now from the webstore here! 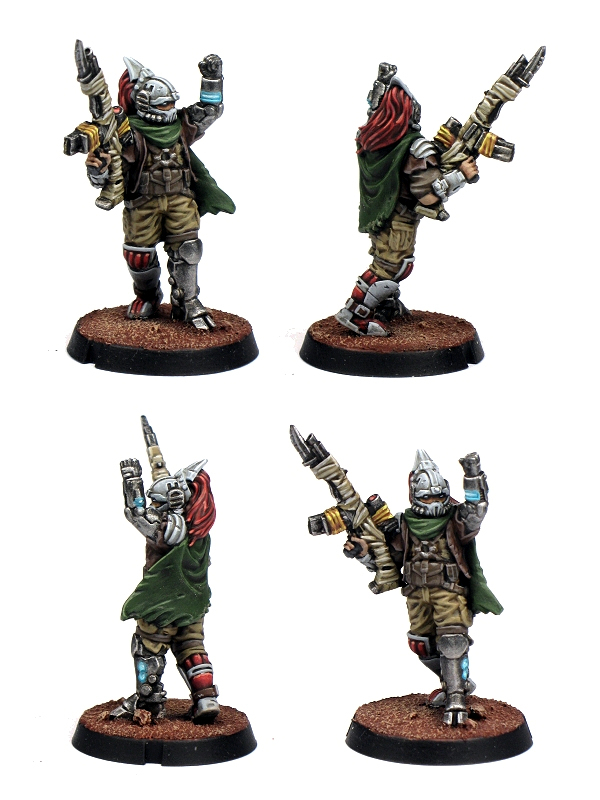 The Broken receive a bit of a boost to their melee capabilities this month, with the release of the resin Hakoyu Grand Master - available now from the Maelstrom's Edge webstore!. 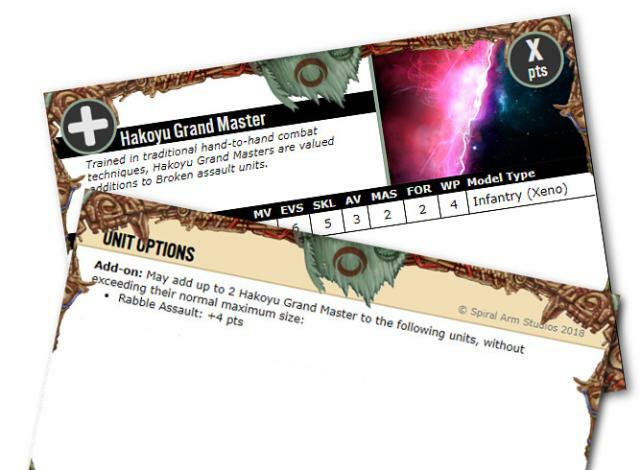 The Hakoyu Grand Master is an optional add-on for Broken Assault units. Equipped with powerful close combat weapons and defensive shields, he can help to defend the unit from incoming close quarter attacks while also possessing the fighting prowess to stand toe-to-toe with a Karist Shadow Walker! With four arms and a horn-like protrusion from their foreheads, Hakoyu can seem menacing at first glance, especially as most have trained for decades in various martial arts and tend to carry at least one large melee weapon with them at all times, despite the fact that they are quite passive by nature. When a Hakoyu does feel forced to fight, their lightning quick reflexes and zealous training means they can usually end the contest before their opponent even knows what has happened. The Hakoyu hail from the remote Yedo system. Their society is governed by a strict code of honour that can be difficult for non-Hakoyu to decipher. They believe the needs of the group are paramount, with the desires and wants of any individual considered trivial. This means Hakoyu prefer to live their lives in their home system, which makes them one of the more rare alien species in the Spiral Arm, with most humans never encountering a Hakoyu in their lifetime. All is not perfect on Yedo however, as the Hakoyu have been locked in a centuries-old war with their neighboring species, the Cera, over territorial rites and a perceived slight to the Hakoyu peoples' honor that cannot forgive. The war has steadily sapped the resources of Yedo, with the Cera using their technological advantages to blockade Yedo from receiving much needed relief supplies for its civilians. This dire situation has forced increasing numbers of Hakoyu to flee Yedo in an attempt to earn a living selling their services throughout the spiral arm, usually as a bodyguard or enforcer, even though such work is in direct conflict with their morale code and likely means they would not be welcomed back to Yedo should they ever wish to return. When the Maelstrom threatens a world, misplaced distrust in Hakoyu sell-swords means they're often discarded at the last second by their former employers and denied a place on escape craft, leaving them ripe to join the ranks of the Broken. The Broken offer the Hakoyu a way out and a collective where most everyone is an outcast to some extent, in which many Hakoyu have found a second home even as they long to someday find their way back to Yedo. The Broken, on their part, value the Hakoyu's fighting skills and their unselfish character. 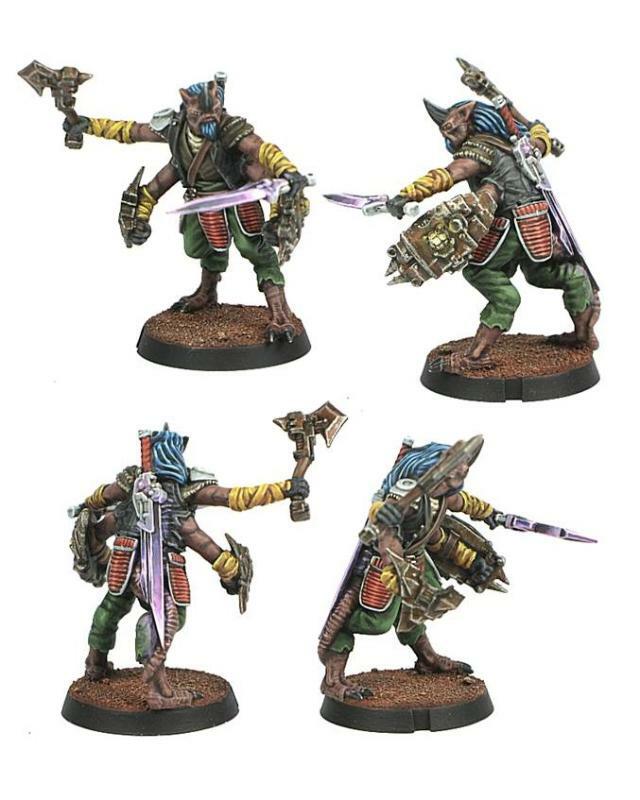 The most sought after Hakoyu are their pinnacle warriors: a Grand Master, as they tend to give any squad the upper hand in any close quarter fighting. The calm demeanor of a Grand Master under fire is enough to convince their Broken squad mates to charge into the teeth of enemy fire rather than to run away. Grand Masters wield deadly Hakoyu phase weaponry, a technology first seen on Yedo and whose methods of construction are a closely guarded secret. These weapons pass effortlessly through energy fields and can cause electronic circuitry to explode upon contact, both highly sought after abilities in the Hakoyu's fight against the Cera. Hakoyu are also renown for their exquisite skill with forearm deflectors, and Grand Masters in particular are able to use these to prevent an opponent from ever striking them, no matter what type of deadly melee weapon they might face. The Hakoyu Grand Master is available now - You can find it in the Maelstrom's Edge webstore here! The unit card will be up in the Force Builder section of the Maelstrom's Edge website in the next couple of days - but here's a sneak peek! 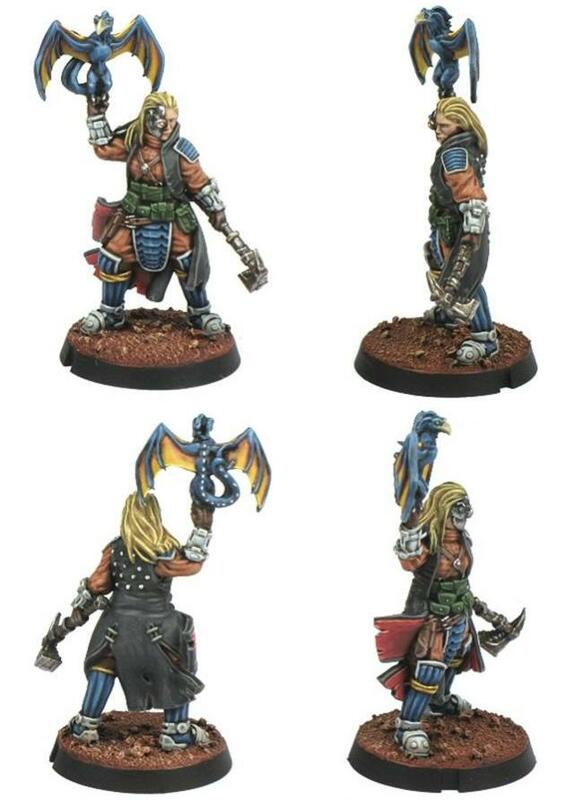 Back when the plastic Broken Infantry kit was released, I cobbled together a conversion of a broken warrior riding a hovering skateboard-type affair, which featured in my 'Easy Broken Rabble Conversions' article. 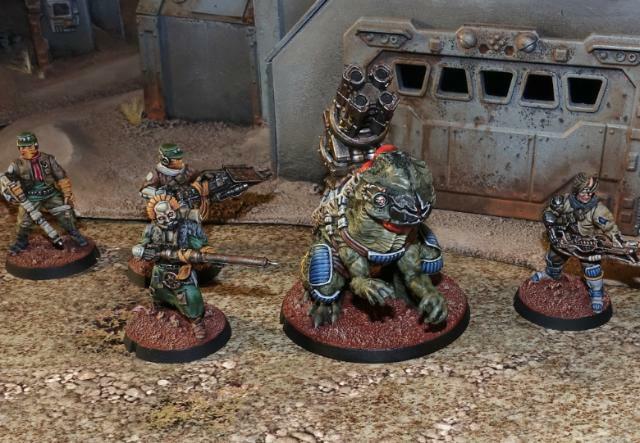 At the time, it was just something made for a little fun, but I found myself thinking that this would make for a cool unit option for the Broken, and so decided to sit down and write up some rules for them. Below you''ll find some ideas for building your own skyboarders using asorted components and some plasticard, and a link to the (unofficial) rules card to use them in your own Maelstrom's Edge games! The primary consideration when putting together any sort of vehicles for the Broken is that they rely on scavenging and trading for whatever they can get, for the most part. As a result, there is very little uniformity in clothing and equipment, and I really wanted to carry this across to the skyboard unit. This meant coming up with three different designs for the three models in the unit, although you could just as easily stick with a single design and custimise them with additional bits and pieces stuck on, or simply with individualised paint schemes on the boards. The first board is the one I build for the original article. I didn't take any in-progress pics of this at the time, but it's a fairly basic constructions - I glued two rectangles of textured plasticard together for the board itself, and then took four turbines (two left and two right) from Epirian Firefly drones, cut away the mounting pins and glued them onto the sides of the board. The rider was assembled from standard broken parts, posed to look like he is balancing on the board, which didn't actually require any converting. I measured out the board on a piece of 2mm plasticard, allowing space for the turbines at either end with room for the rider to stand in between them. Then I drilled out holes the size of the turbines using a spade bit - a 10mm bit was very slightly too small, but was all I had. A little sanding after drilling the hole pushed it out to the right size. I cut the board shape out, sanded down the edges, and glued the turbines in place in the holes. I also added a 'motor' piece using the heat shield cut from a torch (flamethrower) and a trimmed down overcharged powercell, but found on the Broken Infantry sprue. For the final board, I made use of a part of a pipe fitting piece I had left over from the Maelstrom's Edge terrain sprue, from a building project a while back. I had cut through the pipe fitting to make it shorter, which left a nice circular piece that looked just perfect for a turbine surround. I cut a matching hole in a piece of 2mm plasticard using a 12mm spade bit, and then cut the plasticard to the shape I wanted. I made the turbine fan itself out of a circle of 1mm plasticard, and added a circle of mesh to go over the top side of the hole, and a strut to hold the fan, using an injection point cut from an old model sprue. With all of this glued in place, I finished up with another overcharged powercell added for some sort of nod towards functionality. As promised back at the start, I write up a rules card to include these guys as a Vanguard option in your Broken force. You can find this in the Force Builder section of the Maelstrom's Edge website here. 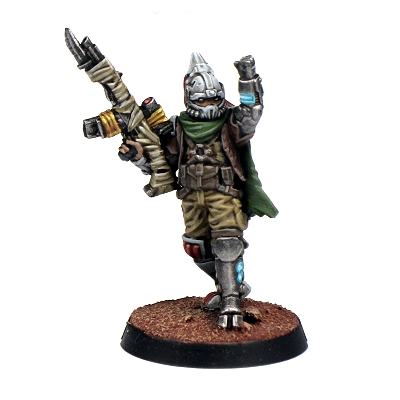 To build your own Skyboarders, you can pick up the Broken Infantry kit along with the rest of the Maelstrom's Edge model range from the webstore here. As always, feel free to pop along and share your work, or ask any Maelstrom's Edge- or hobby-related questions on the Comm Guild Facebook page! The Forsaken are commonly dismissed as simple, degenerate pirates, but the truth is that they usually attack only out of necessity. Piracy is many times the only way their community can survive a hostile galaxy: stealing food, fuel, ammunition and anything else of value they can get their hands on. The Forsaken rarely send out their forces en masse, knowing that a single crushing defeat could mean the end of their entire tribe's existence. Instead, they strike in small patrols, typically led by a Chieftain. Though a Chieftain is granted his or her position of authority by The Assembly, they must first earn the respect of their fellow Forsaken to even be nominated. A Chieftain must be equal parts fighter, diplomat and cunning tactician. Knowing that their forces can never win a stand-up fight against a prepared opponent, a Chieftain leads his warriors to strike unseen from the shadows, quickly fading away before the enemy can root them out and respond in kind. Many an opposing force has underestimated the ingenuity of a Broken force led by a Chieftain, only realizing too late their folly, as improvised booby traps decimate their defensive positions and Broken secretly approach from their rear. 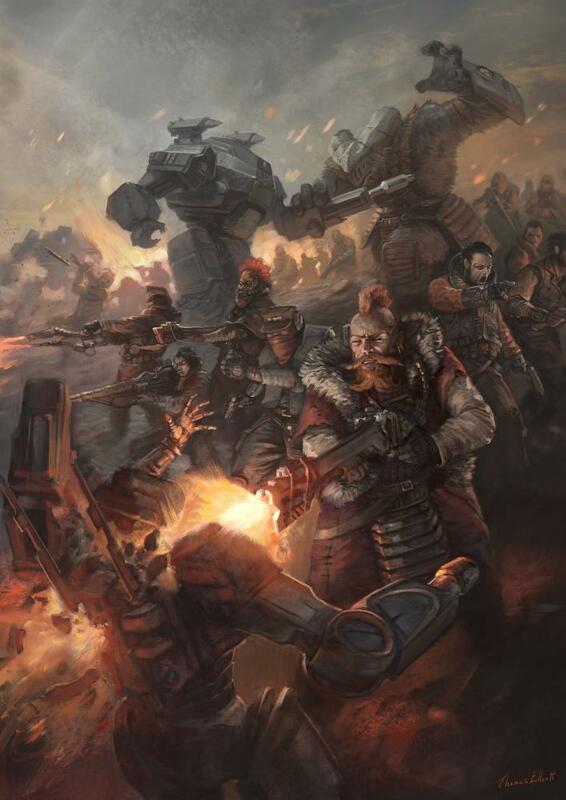 The appearance of a Chieftain can vary wildly both based upon the culture of their original homeworld, but also from that of the Broken Freeport they are now a part of. Chieftains tend to have slightly nicer clothing and equipment than standard Broken rabble, and many see it as almost their duty to show that even amongst the ranks of the Broken, an individual can still rise up and carry themselves with dignity and class. When the Broken do manage to defeat an enemy officer with particularly fancy clothing or an heirloom weapon, a Chieftain will confiscate these valuable items. A Chieftain wears these purloined treasures into battle, as both a reminder of their past victory, and to display their status as an iconic Broken leader. This high detail monopose resin model comes with two different weapon options for the right hand - a customised slug rifle or a customised beam blastgun, and is available now from the webstore here! 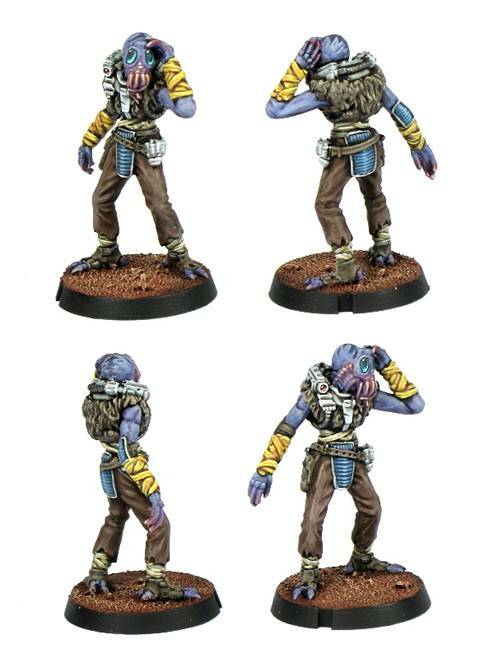 You can also find the updated rules for this model in the Force Builder section here. 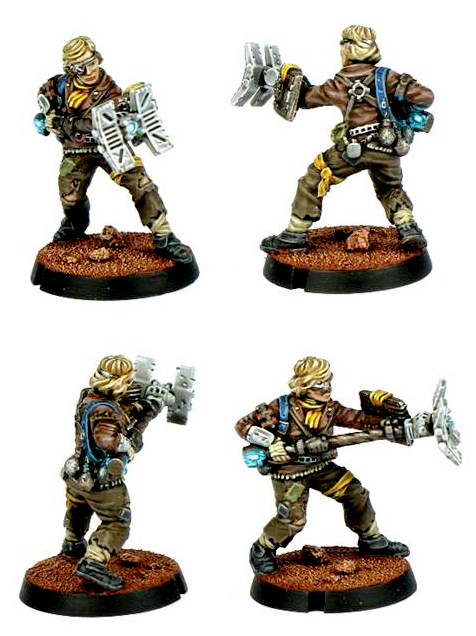 This high detail resin model contains two alternate weapons for the left hand and a xeno spotter in the right hand, and is available now from the webstore here! 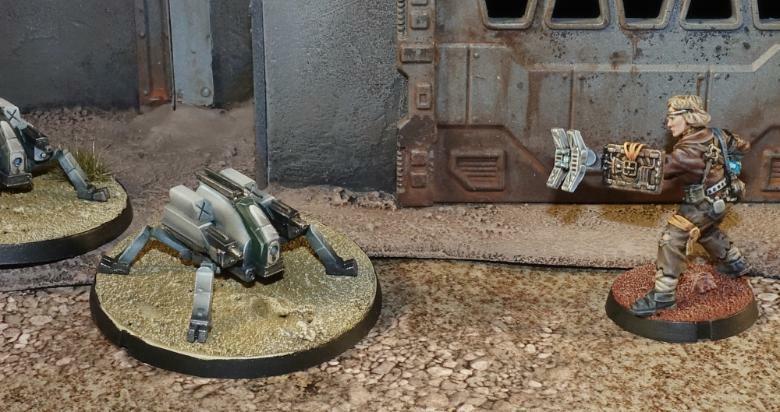 You can also find the rules for this model in the Force Builder section here. 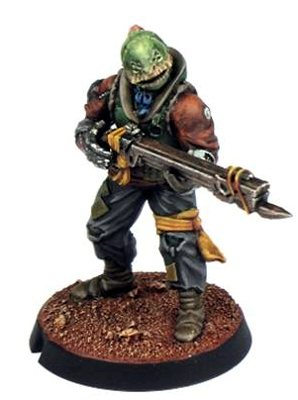 The Marsayan Hypnotist is the next resin release for the Broken faction in Maelstrom's Edge. 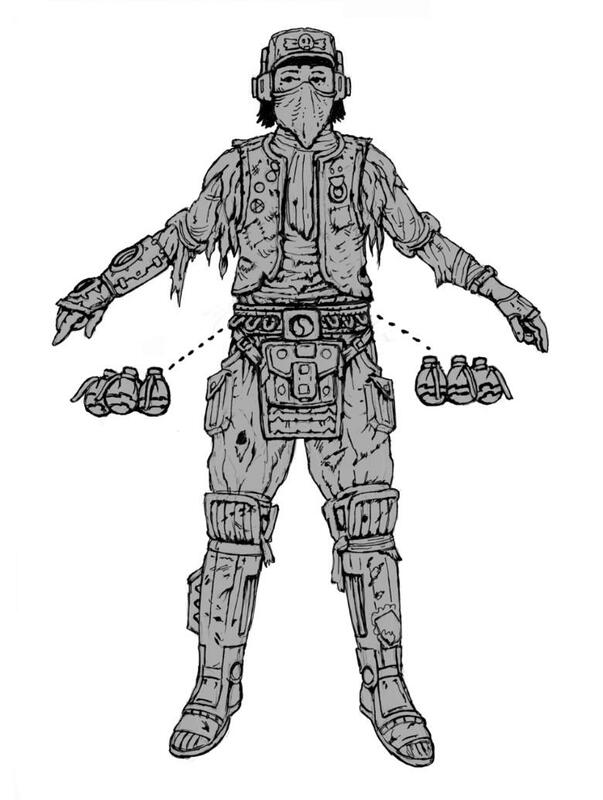 The first 'Add-On' unit type available for the Broken, the Marsayan Hypnotist can be added to different Broken squads to help protect them from enemy fire, as detailed on the model's profile card in the online unit card section of the Maelstrom's Edge website. Marsays are not naturally gifted fighters, nor are they a particularly good shot. With their long limbs, clumsy gait and large bulbous eyes, Marsays don't seem a threat. Disguised behind those eyes, however, is their remarkable ability to influence the mind of others. This is a slumbering ability that most Marsay cannot consciously steer, only presenting itself when the Marsay is angry or fearful. There are some, however, who can exercise this power at will, giving them frightening control over those around them. At a distance, a Marsay can subtly suggest to the enemy to perhaps choose a different target to fire at. Up close, they can create much more intense hallucinations or make an opponent become violently ill. There are rumours that a great Marsayan empire existed, comprising dozens of worlds, stretched across multiple systems. Driven by the most influential telepaths, the Marsayan Empire was thought to be deeply unequal and aggressive towards other cultures. Neighbouring human worlds, either threatened or jealous of the Marsayan abilities, banded together to attack, and most of the Empire was exterminated. The surviving Marsays fled their home worlds and learned to hide amongst human populations. All official records of the Marsayan civilization were wiped out by the arrival of the Maelstrom. Today, Marsays are mostly black market merchants by trade. Common sights in bazaars across the Arm, they are respected for their business acumen and the quality of their wares. Marsayan Ranja is an especially popular liqueur. Equally well known, however, is the Marsayan Swindle. Many an unsuspecting buyer at a Marsay market stall has suddenly felt a little nauseous and returned home with a purchase they can't quite explain. Marsays still hold a deep fear of being imprisoned or killed for their gifts, and deny or downplay their telepathic potency. This fear of human government drives them to hide amongst the shadows of society, and even with the approach of the Maelstrom few are willing to risk being caught influencing their way onto an evacuation ship. Marsays are naturally drawn to Broken Freeports, where humans and xenos peacefully intermingle away from the sight of authoritarian government. Marsays often join Broken fighting forces to procure plundered goods they can later trade on the black market, and it is on the battlefield that their hidden talent for manipulation is often revealed. Marsayan hypnotists are valued on Broken patrols, as they can silently neutralize threats and do not care for even the thickest armour. Whilst these slight, frail creatures are not physically imposing, when they delve into the minds of their enemies, they can make the most hardened warrior flee in terror. Pick up your Marsayan Hypnotist from the Maelstrom's Edge webstore here! The Sig Jammer is the latest resin release for Maelstrom's Edge and helps the Broken counter the technological superiority of their adversaries. As usual, the unit's rules can be found in the online unit card section of the Maelstrom's Edge website, where you are able to learn about the specific rules of the Tech Disruptor (pile on those Suppression Tokens!) and the other equipped weapons of the Sig Jammer. The ramshackle fleets of the Broken don't possess extensive R&D departments or mass production facilities, but what they lack in investment, they make up for in unregulated ingenuity and daring invention. The Broken is a haven for technological savants and rebellious hackers, rulebreakers ostracised and hunted by a society scared of their technological prowess. Whether driven to the Broken by the Maelstrom or the authorities, these maverick inventors are encouraged to experiment and tinker. These 'Jammers' soon thrive among the Broken ranks, using their skills to break into computer networks, disrupt signals, and generally set technology against their users. It is a rare mercurial talent to be able to invent the kind of disruptive equipment the Jammers carry, and sending a Jammer Savant deep into enemy territory is not a viable strategy. Instead, Broken leadership encourages anyone with a natural aptitude for technology to become an apprentice, or 'Sig Jammer'. In peacetime, these neophytes are a mixture of servant and apprentice, taking care of a Savant's every need, or searching for the particular parts needed to complete the Savant's latest technological masterpiece. Once the Broken go to war, Sig Jammers are given disruption tech and thrust towards the enemy to cause havoc. A Sig Jammer's average lifespan doesn't tend to be terribly long, yet there is never a shortage of souls looking to become one. In fact, in some Broken societies, a lottery has to be held to select new Sig Jammers from amongst all the hopefuls. This is easier to understand when the alternative is being drafted into a Broken Rabble unit, which is roughly akin to being thrown into a meat grinder. In battle, Sig Jammers sneak near enemy lines and wage short-ranged technological warfare on the enemy, degrading their weapon systems and disrupting their broadcast frequencies. Sig Jammers project a localised disruptive field from their Tech Disruptor beam weapons to hamper electronic devices, disorienting or shutting down enemy targeting and support systems. Sig Jammers also use their arm-mounted targeting scrambler for protection, sending out dozens of false positives to enemy targeting computers, causing additional confusion and pandemonium amongst their adversaries. 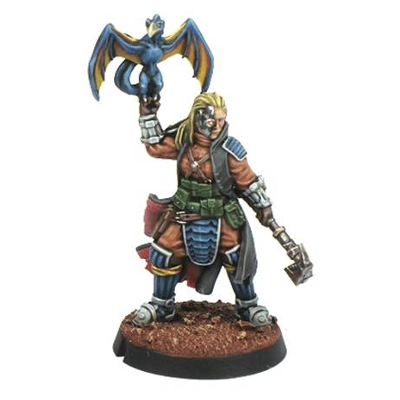 We are proud to announce that the third Maelstrom's Edge faction has now launched, with a range of plastic models. We present to you... The Broken! From the factories and the slums, the mining complexes and the farms of the galaxy come the Broken, a growing movement of citizenry angered by the lack of opportunity to escape the Maelstrom. They are a diverse mix of workers, aliens, and rogues left on doomed worlds by the ruling parties. These survivors take matters into their own hands after being left behind. They pool their resources and knowledge in a communal effort to escape the Edge. Derelict ships are repaired. Affluent people’s ships are stolen. Government ships are commandeered. Any ship available is pressed into service for the Broken. They are a group unlike any ever seen in the galaxy. Fear, hate, anger, need fused them, these abandoned people, into an unstoppable force with one goal - escape the Edge. The Broken is a term used to unify all such desperate people across the Edge. Their motivation, methods, and sanity vary wildly from fervent revolutionaries to callous pirates to the few who have stared into the maw of the Maelstrom only to come away unhinged. The Broken are available for purchase now at the Maelstrom's Edge webstore. You can also check out the unit cards and faction rules at our brand new online force listing section. Half a dozen models can be built from a single set of sprues, with enough options for all of your sci-fi civilian modeling desires to be fulfilled. 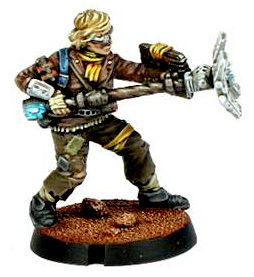 Suitable as proxy models, conversion fodder, and part swaps for other ranges, there are plenty of uses beyond Maelstrom's Edge, so those spare parts you have left over when building a Broken force will have plenty of uses. The kit is extremely versatile, with every arm, torso, legs and head a distinct part and combination. 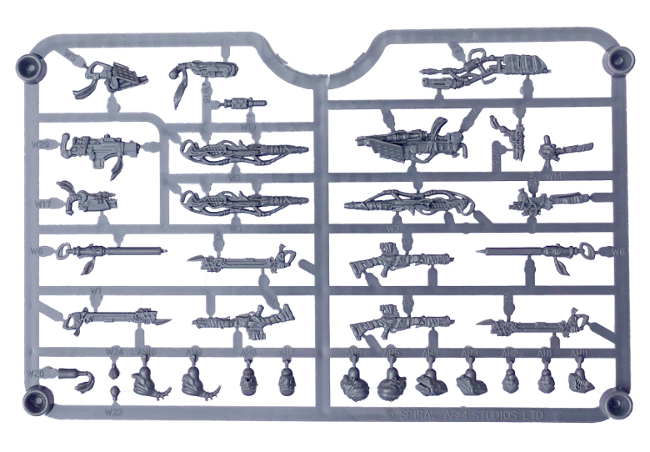 No hands are built in to the weapons so they are easily switchable with other models, and the entire kit is almost fully parts compatible with our Karist and Epirian lines, allowing for rogue Karist and Epirian forces to represented, as well as converts and captured equipment. The kit also has unprecedented diversity for a plastic sci-fi civilian range, featuring plenty of female heads and gender agnostic heads, as well as large mixture of alien heads with variant poses to ensure you can build a force themed around a specific alien type if you so desire. Keep your eyes on this website for assembly instructions and more articles featuring The Broken in the near future. We are also pleased to report that this release kicks off the start of our increased release schedule, with a release planned every month. Make sure you follow us on facebook to see all of our releases as they are revealed! 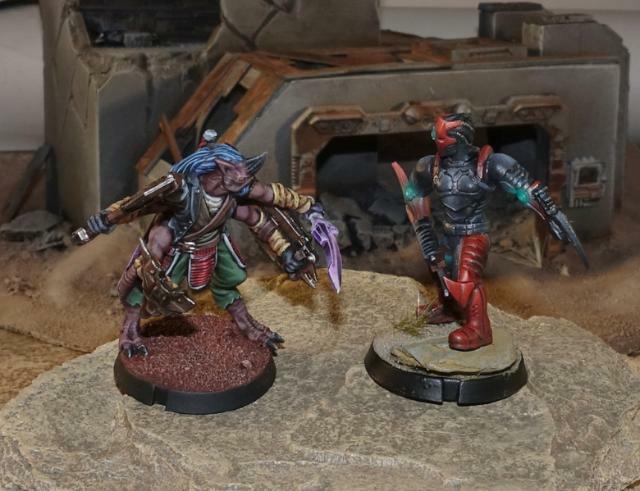 As the release of The Broken gathers speed, it is time to share some more photos of the upcoming models with you. All of these can be built using our plastic kit. The kit will allow three different units or an HQ model to be assembled from it, so the 4 sprues that make up the kit will be a solid foundation of any Broken force. Keep your eyes on the comm guild blog, our facebook page, or make sure your email address is registered at http://www.maelstromsedge.com to be notified when the Broken go on sale in Sep 2017. Here we have the main weapon of the basic Broken infantry unit. A hastily assembled, durable shotgun-type weapon. Sculpting of this is already complete, and production of the Broken continues to march towards release at a good pace. We continue our preview of the Broken with another weapon - a crudely retrofitted pistol. Fabric wrappings are a very common sight on Broken weaponry, and this long triggered weapon does a good job of showing the range of some of their designs. The long trigger allows the weapon to be fired away from the body, minimising risk to the firer when ammunition is unreliable or the weapon is overcharged. Time for us to share our first teaser from The Broken faction. 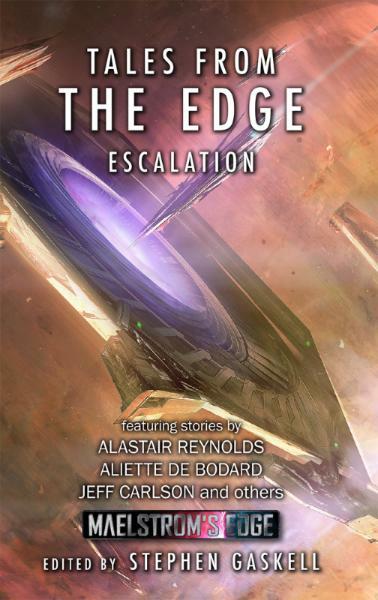 The story 'Scraps', coming in next week's book release (Tales from The Edge: Emergence) features the use of an EMP boosted Harpoon in the hands of The Broken. Be sure to check it out when it is released! Epirian SecDef face off against the Remnant Militus! 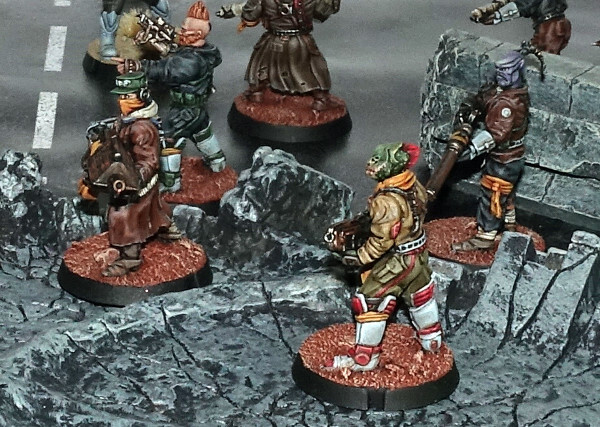 New Faction & Plastic Release: The Artarian Remnant! 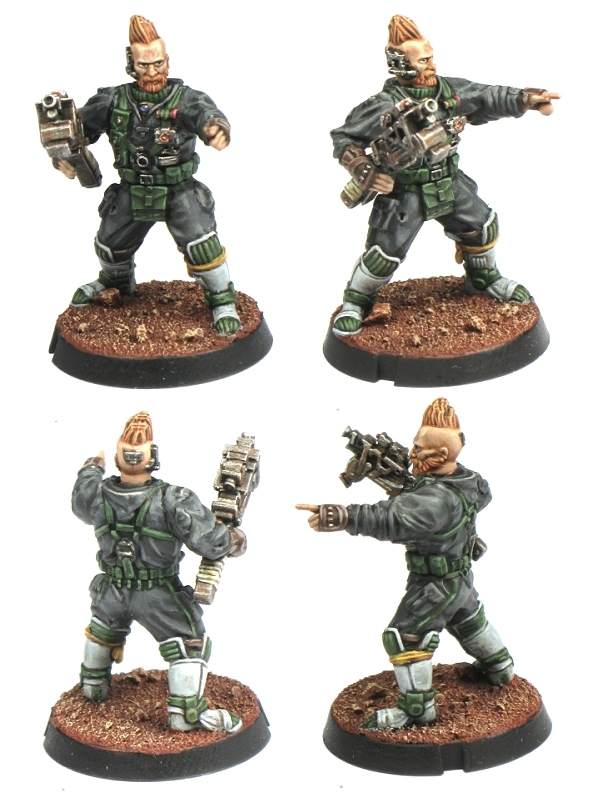 New resin release: Epirian SecDef Boostpack Specialists! Website Update - Printable Unit Cards! 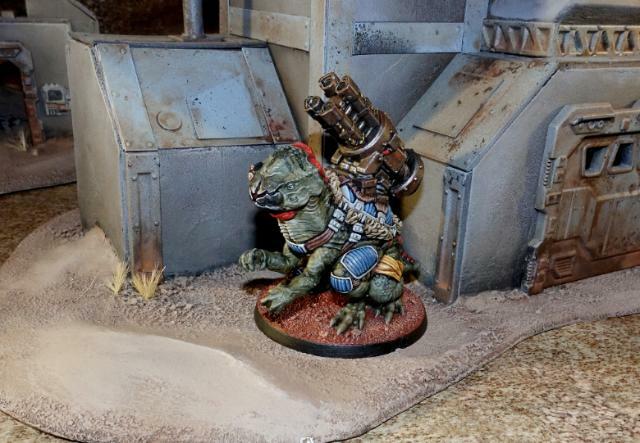 Terrain Spotlight: Generator Made From Bubblegum Tape Dispensers! Terrain Tutorial: Hack the Terrain Sprue! 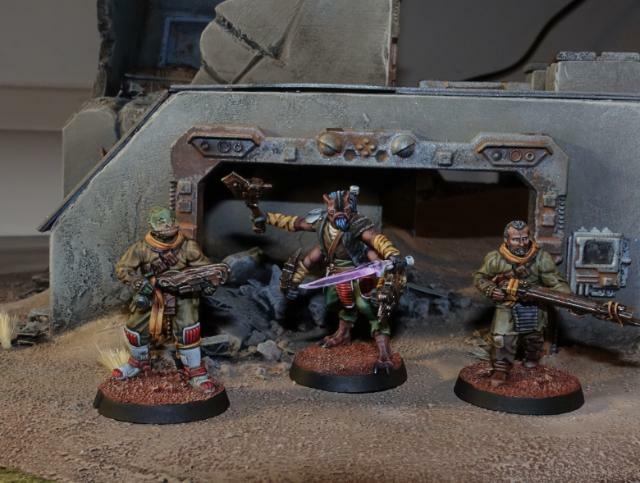 Modeling Spotlight: Epirian SecDef Heavy Weapons Team conversion & rules! New Epirian Resin Release: Contractor Drones! 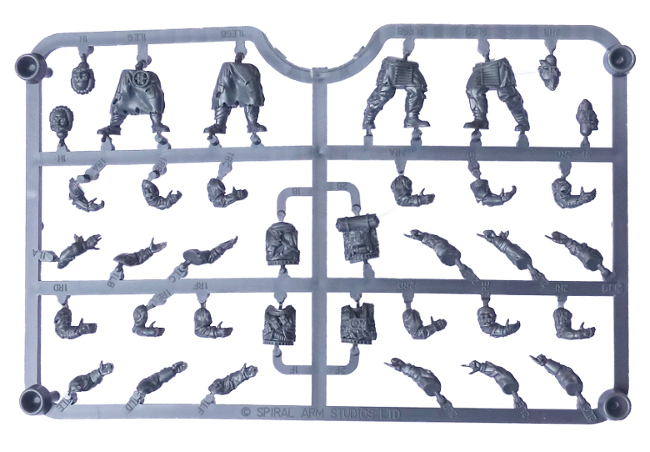 Broken infantry sprue: which arms fit which weapons? Terrain Spotlight: Knights of Dice Desert Residence meets the Maelstrom's Edge Terrain Sprue! Terrain Tutorial: The Foam Ball Cactus! Terrain Spotlight: Mini Hab Domes from plastic bowls! Spotlight: Maelstrom's Edge Terrain Sprue Tree Decorations! Below are the most frequently used tags in the blog. Hover over a tag to see a count of entries, click a tag to see the most recent posts with the tag.